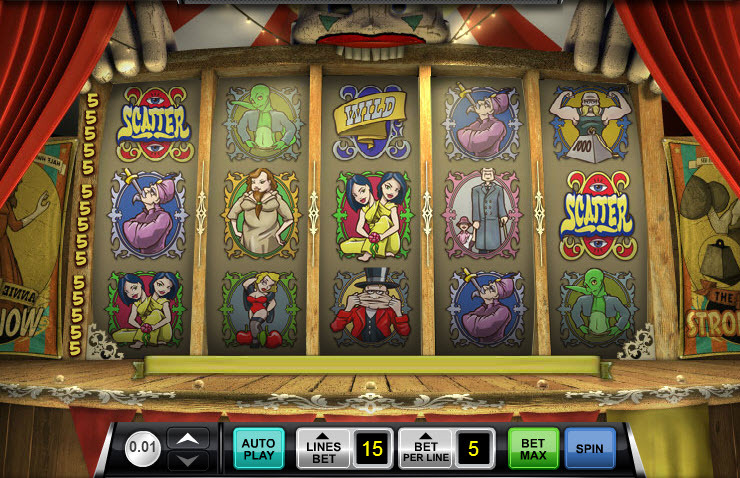 Overview: Step right up and be amazed with all the wonders of Freak Show, a 5-reel, 15-line slot game. Bet 1-5 coins valued at 0.01 to 1.0 and find the right combination of traditional freak show attractions to collect the game's biggest prizes. 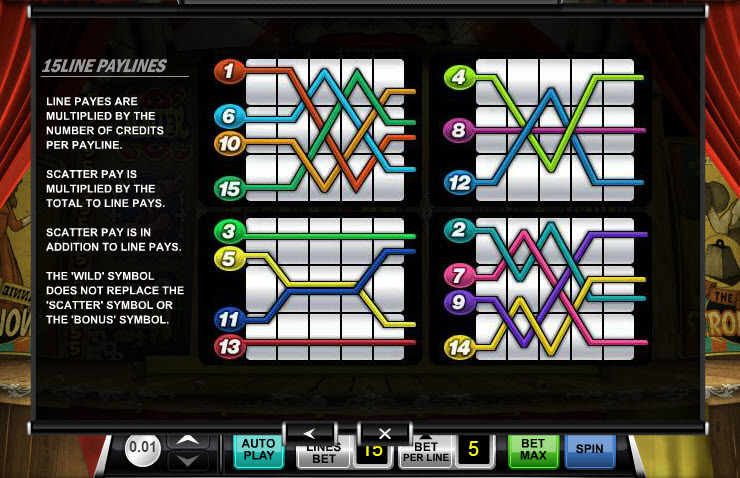 Find five men with the elastic face in one pay line and win 1000 credits, or find five "Wild" symbols with a max bet placed and get paid 10,000 coins. Collect three or more "Scatter" symbols anywhere on the screen and get paid. 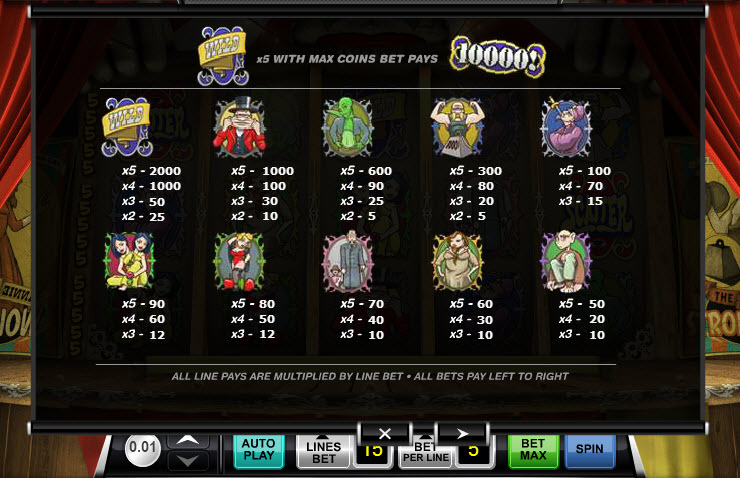 Three symbols pay 5 credits, four pay 50 and five pay 500, which could also be multiplied depending on the size of the bet per line. 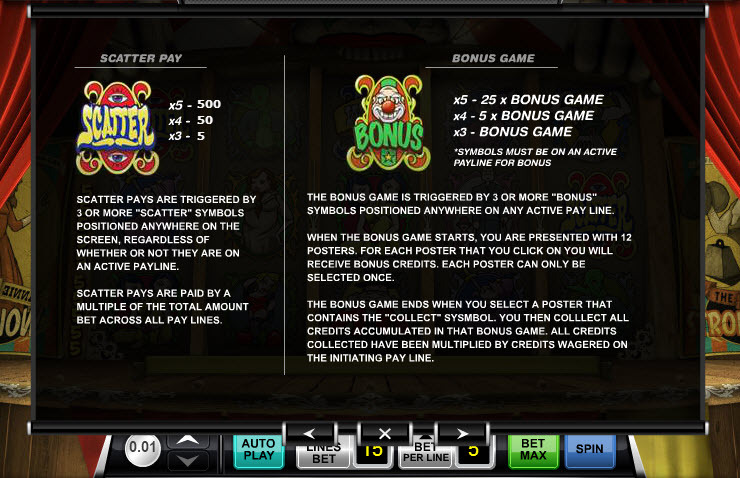 Meanwhile, 3 or more "Bonus" symbols on a pay line will activate the Freak Show bonus game. Once inside the game, a poster with 12 sections will appear on screen. Click on one of the 12 poster sections to reveal the hidden prize. Keep clicking (and winning!) until the section containing "Collect" is selected. Similar Slots: If you like Freak Show, you might like these other slot machines from Ace Gaming: Black Magic, Fruit Fuzion, King's Castle, Party Bucks, Samurai Slot.